1. Why is Teaching Strategic? A few DSA members that were teachers in West Virginia public schools began having conversations about new austerity measures facing public employees. Our wages had been stagnant for years—unlike our healthcare costs, which were climbing. We formed a reading group, held brainstorming sessions, and quickly agreed that winning our demands would require militant action. 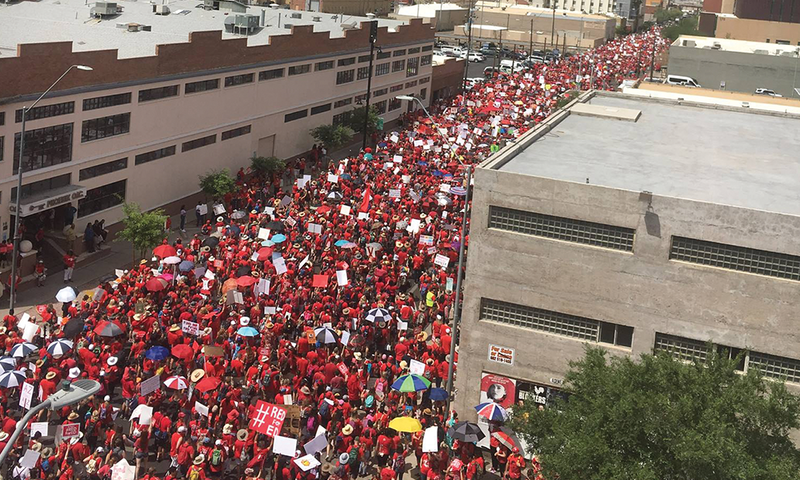 We had no idea that we were laying the groundwork for what would culminate in a historic, successful nine-day strike that spread like wildfire to Oklahoma, Kentucky, Arizona, Colorado, and beyond. Our immediate win in West Virginia was a 5% raise for all public sector workers, plus halting charter school legislation and attacks on seniority—no small feat. But crucially, our movement’s demand was that the money come from highly profitable corporations that have long exploited West Virginia’s natural wealth. The revenue battle is ongoing, but our popular campaign against corporate interests will make it harder for the ruling class to drive a wedge between public employees and other working class West Virginians by cutting services. In fact, as school employees, our direct relationship to the economy of West Virginia played a critical role in the decision to strike and the solidarity we were able to build with our communities. The Public Employees Insurance Agency (PEIA) that we were fighting for covers 1 in 9 West Virginians. Teachers in our state see hunger, homelessness, and the trauma caused by poverty every day; as our students’ economic conditions worsen our jobs become harder and more essential. Knowing that two-thirds of our students rely on free and reduced-cost lunch, teachers spent the weeks leading up to the strike making calls to local churches, food banks, and community organizations to set up food distribution sites. Parents reacted by joining us on the picket lines, making calls to legislators, and shutting down conservative attacks against “selfish” teachers. Local businesses responded by bringing food and coffee to the Capitol and picket lines, and faith leaders sent out messages of support. Although our immediate demands were for public employees, it felt as though the entire state of West Virginia had taken on the 1%. We have our work cut out for us going forward. PEIA still needs to be funded and a 5% raise isn’t enough to keep teachers in the schools for the long term. But after achieving a significant win, workers are bringing a new sense of their own power into this ongoing struggle. The strike has renewed interest in our state’s rich, militant labor history and has reinvigorated local DSA chapters. Many teachers and service personnel have begun to view politics through the lens of class consciousness. With socialists active in our organizing, we’ll be in a strategic position to make bold, visionary demands to take on the capitalist class. The West Virginia strike didn’t happen by chance. It was the result of creative shop floor organizing by teachers with socialist politics. 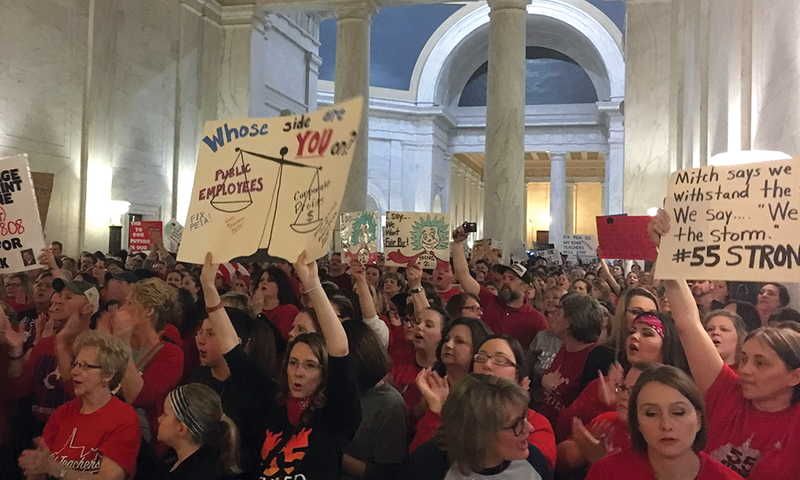 These teachers introduced a fundamentally different vision of their state than what was on offer from either elected officials or union leaders. And they were able to do this because they had organic connections to their co-workers. Rather than shouting socialist messaging at workers from afar, these teachers were able to alter the direction of the movement from within. This pamphlet argues that socialists should take jobs as teachers (and other school-based workers) for the political, economic, and social potential the industry holds. If DSA members become active in workplace organizing for the long term, we can wage fights similar to West Virginia—and crucially, improve the working and living conditions of our co-workers and communities. This pamphlet argues that socialists should take jobs as teachers (and other school-based workers) for the political, economic, and social potential the industry holds. It begins with a political grounding of education as a strategic industry to organize. It then gives a description of what teaching is like day to day and how it differs from other jobs that people with left politics might take. And finally, it provides a basic roadmap for how to get a job in education. Socialists have a long history of involvement in the workplace. Socialists believe that workers create society’s wealth and that the working class is the only class capable of governing society democratically. It is at the point of production that workers create value beyond what they are compensated for. This is what Marx called “surplus value,” which is realized as profit. While the vast majority of teachers are public employees, this doesn’t remove us from the domain of capital. While teachers don’t make a product that is sold on the market, we are necessary in the reproduction of a capitalist economy and the perpetuation of classes. It is teachers who train, both socially and technically, the workers of the future. When capitalist power is strong, so is the drive to squeeze the public sphere, to cut funding from universal programs (like public schools) and redirect it towards the market (like private schools). The often abysmal funding of schools that helped spark the massive red-state strikes of early 2018 made clear that even though teachers are public employees, we are not immune to the political and economic pressures of the billionaire class. If socialists have long viewed the workplace as central to the socialist project, they have also seen the labor movement as central to organizing the workplace. 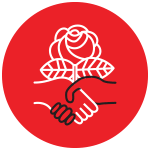 The history of this strategy is long and varied, but is summarized well by Kim Moody in his essay, “The Rank and File Strategy: Building A Socialist Movement in the U.S.,” Moody writes, “bring people together at the heart of the social relations of production. This is where both class formation and class conflict begin. Except on those rare occasions when the class struggle breaks into open political warfare, it is at the workplace that the tug of war between labor and capital is sharpest and most recurring…” There are of course other sites of class conflict—against landlords, healthcare providers, and educational institutions themselves, for example. But the most effective socialist movements have all recognized that left politics are a non-starter without deep involvement in the labor movement. But none of this changes the fundamental fact that in a capitalist economy, workers produce more value than they receive back in wages. The need to challenge the terms of this exploitation, and ultimately to abolish it, remains central to the socialist project. Given the labor movement’s structural tendencies within a capitalist economy towards co-optation, bureaucratization, and conservatism, socialists have also long been devoted to transforming the labor movement into one that is both democratic and militant. Communist Party members in the early 1920s formed the Trade Union Education League (TUEL) to fight for racial equality, union democracy, and industrial unions rather than craft divisions. They also attempted to provide a theoretical grounding that connected the task of building the labor movement to a larger vision of socialism. In the 1970s, members of the International Socialists (IS) and many other groups took jobs in strategic industries in an attempt to politicize the rank and file upsurge of the day. IS members went on to help found Labor Notes and Teamsters for a Democratic Union in order to connect these disparate union reform efforts. Since the resurgence of class politics in the 2010s, and especially in the wake of DSA’s massive growth since 2016, we are now in a position to develop a concerted, coordinated presence in unions, to help shape the militancy and political ideology of those unions, and ultimately to play a role in building working class power. Why Is Education a Key Sector? If the labor movement is a key site of struggle for socialists, the question remains why education is a key industry. There are certainly industries where workers are far more oppressed; an obvious question, then, is why we wouldn’t focus on those. In short, while all workers deserve and benefit from the power and dignity that a union can generate, the reality of our political economy is that some groups of workers have more leverage than others to win political and economic demands for the working class as a whole. Some sectors are therefore more strategic to organize. Education is one of those sectors. Here’s why. Education is the most unionized sector both in the United States and globally. While it might seem counterintuitive to strengthen unions that already have high density, big upsurges in unionization have often occurred because organized workers pushed their unions towards a more militant approach, which forced the unions to commit substantial resources to new organizing. What many consider labor’s golden age—the CIO led efforts to organize new workers in the 30’s and 40’s—was a direct result of a split among workers in the AFL. It was the militancy of one group of organized workers (what would become the CIO) that increased the power of the working class as a whole. The reality of our political economy is that some groups of workers have more leverage than others to win political and economic demands for the working class as a whole. Every state in the nation has an affiliate of one of the two major education unions, the National Education Association (NEA) and the American Federation of Teachers (AFT). In many districts there is already a structure to collective bargaining and contract negotiation. Because we don’t need to build the union from the ground up, we can focus on the workplace and political fights that govern our working conditions. Teaching is also strategic in that education is a necessary good for the development of the workforce. In order to have a reliable workforce, society needs a population with technical and social skills. Historically, it was most efficient to coordinate the provision of education through a state-run public school system. While there are constant struggles over public education, including its semi-privatization through charter schools, its role in the development and socialization of youth seems here to stay. Education is difficult to get rid of not only politically but physically, too, in that it’s extremely difficult to automate. Teaching is a dynamic, complex, and intellectually demanding skill. While ed-tech companies and their allied politicians are attempting to mechanize education and take the educators out of the equation, this is hard to do for both technical and political reasons. Even the most conservative parents want their children taught by kind, experienced humans. And mechanization becomes harder as more and more students receive services in special education and English as a new language. Now more than ever, teachers are interacting with other teachers in the classroom, which makes automation even more difficult. Our strategic power is made possible not only by our location in the economy and in civil society but by our size. Education is a sizable institution in nearly every town, county, and city in the country. 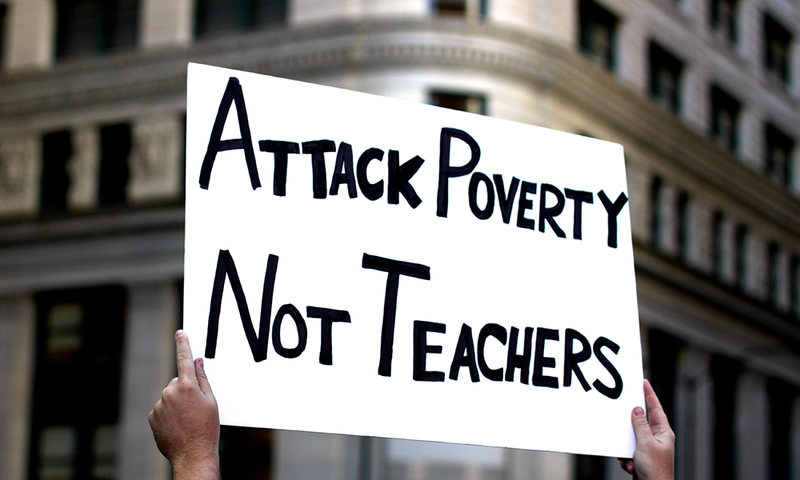 When teachers take job action or strike, it has enormous consequences for the district. Administrators either have to staff the buildings, which is difficult or impossible, especially with workers of similar skill and training, or they have to close the schools, forcing parents to call out from work or arrange alternate care. Of course, this disruption can also make parents feel that teachers are holding them hostage. While this has happened in the past, if parents are organized and feel an investment in the struggle, the framing of teachers as greedy becomes ineffective. In addition to our own size, this massive, highly unionized labor force has direct, organic connections to a large, diverse swath of the working class: our students and their families. While teachers have at times been derided by the right and the liberal left as selfish and narrow-minded, teachers have also experienced massive public support from the communities where they live and work, as in Chicago in 2012 and West Virginia in 2018. Students and their families have a shared interest in improving our schools and this creates fertile ground for labor-community alliances. If socialists and other activists are not firmly rooted in a workplace or community, they can be perceived as outsiders by the people they aim to organize. But socialists who teach in working class communities have found a direct stake in the struggles of that community, outside of the traditional union context. These can include campaigns around police brutality, immigrant rights, and environmental justice. Educators can organize with the community rather than having to attempt solidarity from afar. Teachers also have organic connections to the non-teaching staff in our schools. We work alongside secretaries, counselors, food service workers, maintenance staff, and more. Often these workers are represented by different unions, and while this can be a hindrance to organizing, it can also be a boon. Through “coordinated bargaining,” as in cities like St. Paul and Chicago, school employee unions can add to the pressure on city government to fund schools. Finally, despite attacks on schools and teachers unions in the recent past, teaching is still one of the most stable professions in the United States. In most states teaching pays a living wage with benefits, including health insurance. Even in West Virginia, where teachers experienced some of the lowest pay in the nation, they were sometimes the highest-paid workers in their communities. These wages allow teachers to sustain themselves and organize for the long term. While the rate of turnover is increasing, it’s not nearly as high as in the retail, service, or even nonprofit sectors. Furthermore, teachers are often high-status individuals in their communities. They can command respect and people look to them as moral and social guides, especially for their children. All these strategic factors argue for the presence of socialists within education because of the political and economic leverage teachers could exert if organized. The rank-and-file strategy is not only concerned with recruiting our co-workers to socialist organizations like DSA (though in many cases we can and should do that). The aim of the rank-and-file strategy is to build organizations of working class people that challenge the power of capital. Organizers on the shop floor with a socialist political vision can help build struggles that draw in large numbers of workers and raise the class consciousness of many. It is out of these struggles that new socialists will arise. In this work we don’t need to convert everyone to socialism. In fact, many of the people we organize with will hold a mix of conservative, racist, sexist, and other bigoted beliefs alongside their other more progressive views. Rather, we as socialists need to build a “militant minority” of class-conscious teachers that can move our unions in a more militant and democratic direction. This direction, steered from the shop floor, should aim to make universal demands that bear on the lives of the working class at large. Unfortunately, the existing leaders of most teachers unions don’t encourage this bottom-up style of rank-and-file organizing and in many cases actively work to squelch it. Young teachers should not expect to instantly move their union toward militant action, especially where the organizational infrastructure of the union is strong (unlike in many of the red states where we saw strikes in 2018). Given that these unions often feature rigid hierarchies of decision making, especially at the national level, young socialist teachers must be willing to dig in for a while, grow our credibility, and become organic leaders among our co-workers. Furthermore, in some districts, steward positions are highly regarded, and faculty are unlikely to vote in as steward or take direction from a young person who is new to the profession. Unlike “salting,” in which a worker goes into a non-union workplace for a short period of time to facilitate a union campaign, committing to rank-and-file labor organizing should be seen as at least a multi-year project and ideally longer. 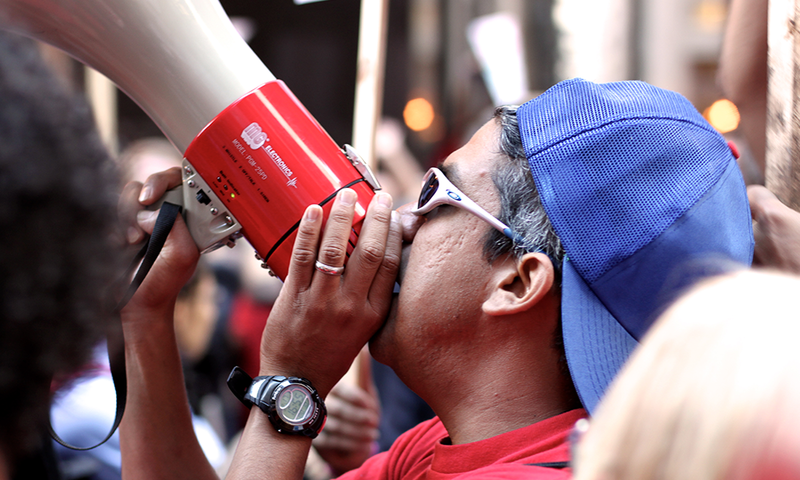 We’ve seen that teaching holds enormous potential for labor movement activists. But politically active teachers should also feel invested in the job itself. Ultimately, organizers will be more effective in a job they can see themselves doing for years, even decades. While teaching is neither easy nor especially well paid, it can be a personally fulfilling and economically sustainable career for those who seek to advance class struggle. Despite lower unemployment and modest wage gains, the job market for all workers in 2018 is still relatively grim. According to the Economic Policy Institute, the last decade has seen abysmal wage growth for recent college graduates, at the same time that college tuition has skyrocketed. Earnings for college graduates actually dropped from 2007 to 2011, averaging $7 per hour more than those of a high school graduate. As The Guardian notes, this wage difference shrinks further when you factor in tuition costs, unpaid internships, and four years of being out of the workforce. The job market for teachers is no exception. According to the National Education Association, the average starting salary for a public-school teacher is $38,617 per year. The average salary for all teachers is quite a bit higher, but teachers still make less than those in other professions that require similar amounts of training, such as computer programmers, accountants, or nurses. Despite this, compared to many other jobs taken by millennials fresh out of college, teaching doesn’t look so bad. Teaching positions, even in lower-paying states, offer benefits, opportunities for tenure, and regular, if small, raises that are rare in many other industries. Of course, teaching is not for everyone. It can be physically and emotionally draining, especially in schools with large classes, few resources, or a hostile administration. Almost all teachers spend considerable time preparing for classes outside of their formal working hours. Even in districts and states with generous compensation packages, there is never enough time in the day to do everything necessary to teach well. This is especially true for new teachers, who will likely need to put in evening and weekend hours to develop curriculum, grade student work, communicate with parents, and more. While teachers do get summers off, many work during July and August to supplement their base pay. As the Chicago Teachers Union has consistently emphasized, students’ learning conditions are teachers’ working conditions. And in many places, those conditions aren’t great. The inequality of society at large manifests daily in our classrooms. Students may lack housing, food, safety, and academic materials, not to mention emotional support. Teachers may have 150 students per day in their classrooms. As teachers in West Virginia, Oklahoma, and Arizona have shown, they are given few resources to address these enormous challenges. Chronic underfunding means teachers are constantly asked to do more with less. Many use their own wages to buy supplies for kids who wouldn’t get them otherwise. In a majority of states, school funding levels have still not recovered from the 2008 recession-era cuts. Lastly, demands for “data-driven accountability” have put teachers under tremendous pressure to show “growth” in student achievement and thus only to teach that which can be measured. With the support of billionaire families like Gates, Walton, and Broad, these so called “value-added” models of assessment have proliferated. In many states a teacher’s effectiveness in the classroom is in large part judged by student test scores. Aside from incentivizing cheating, these systems pressure teachers (and entire schools) to narrow the curriculum at the expense of a holistic and fulfilling education. Still, for many people the rewards of teaching outweigh these drawbacks. It’s likely you have had at least one teacher who shaped your perspective, changed your worldview, or inspired you. You could be that person for your students. No matter what subject or grade you teach, your exchanges with students can help shape a generation of critical thinkers and political actors. You will be a key source for how many young Americans come to perceive the world around them. You may even have the opportunity to teach about social justice and liberation history. And, crucially for organizers, your political work doesn’t end at the classroom door. Your interactions and shared struggle with co-workers can be just as fulfilling. When considering teaching for its political potential, we can compare it to other jobs socialists might take. In recent history, the more common path for DSA members interested in the labor movement was to work as staff for a union. Placed in organizing, research, and political departments, socialists hoped to steer unions in a more radical direction. This “permeationist” strategy, as Kim Moody has called it, resulted in some meaningful contributions, but many union staff with socialist politics also found themselves devoid of real decision-making power, fighting deeply entrenched bureaucracies, and aiming to build a movement of workers that wanted nothing to do with the union, often for good reason. There is a crucial role for socialists to play as union staff in building democratic, militant unions. But without a base layer of organizers at the workplace, the potential for change is far slimmer. There is a crucial role for socialists to play as union staff in building democratic, militant unions. But without a base layer of organizers at the workplace, the potential for change is far slimmer. What is more common for DSA members today is to work in semi-professional jobs without significant potential for organizing, in fields like media, technology, administration, and the non-profit sector. While many of these jobs require a college education, few pay especially well and even fewer are strategic when considering the political and economic effects of job action. If a rank-and-file job feels like the right option for you, but teaching doesn’t, there are other industries that are also strategic and in which DSA members are already organizing. Like education, healthcare is the target of privatization efforts and shares some strategic elements with teaching (size in the economy, difficulty of outsourcing, public support). For many, nursing or other healthcare jobs may be a better fit than teaching. Logistics and transportation jobs are also good options for new labor movement activists. Our “just-in-time” economy has given tremendous leverage to workers who pack, ship, and move goods. As companies attempt to reduce costs by cutting down on inventory, those firms become particularly vulnerable when workers don’t deliver. While these jobs can be physically demanding, they also seldom require a college education. Those who do want to teach have an excellent opportunity to build a fighting labor movement while also working a job that can be deeply rewarding. New teachers can join a movement that as of recently is not only winning demands but also setting an example for the rest of organized labor. Industries that were identified as strategic by socialist organizations that made the “turn to the working class” in the 1970’s—trucking, manufacturing, communications, steel, and a few others—were generally easy to enter. Teaching, which requires professional training, often with significant financial barriers, is somewhat different. Still, for many willing to make a long-term commitment to building a worker-led labor movement, these barriers can be overcome. If you know you want to commit to this project, here’s a basic introduction for how to enter the field. Except in limited circumstances, all K-12 teaching jobs require a bachelor’s degree and certification from the state, recognizing that you have been trained for the position and are legally allowed to teach. There are a couple of different ways to be certified. Until recently, most teachers pursued a “traditional” or “standard” certification through a bachelor’s or master’s degree in education. Students major in elementary education, teaching students with disabilities, teaching English as a New Language (ENL), speech therapy, or other education-related fields. For middle and high school, states typically require expertise in the subject (usually a degree in science, social studies, math, or English) as well as credits in pedagogy. This traditional path begins with standard coursework and culminates in a semester-long student teaching placement. As teaching has become increasingly deprofessionalized in the past twenty years or so, “accelerated” teacher preparation programs have spread. These programs allow people with a generic bachelor’s degree to enter the classroom with little to no teaching experience under a “transitional” certification. The most well known of these programs is Teach for America, long an object of scorn for those left of center in education for its role in supporting charter school expansion, reducing the required training time of teachers, and deskilling the profession. But Teach for America is now just one among many of these programs. Numerous states and cities are now adopting similar accelerated programs to fill teacher shortages. Both traditional and accelerated programs have their benefits and drawbacks. Traditional programs allow new teachers to focus exclusively on their training while in college, preparing as much as one can for the challenges to be faced once the school year begins. Yet this route can be financially hazardous, as students are forced to take on loans to pay for college. This can put a huge debt burden on new teachers, who must now pay back their loans on a salary that is adequate at best. Accelerated programs draw potential teachers who have college degrees but no teacher training. While these students will likely still have student debt from their undergraduate degree, accelerated programs allow candidates to complete their training while teaching and earning a full salary. And often the training program will subsidize the cost of the master’s degree the new teacher is required to pursue. Yet these accelerated programs can also be extremely challenging. More often than not they place the most unprepared teachers into the classrooms of students with the highest needs—those who are poor, homeless, food-insecure, learning-disabled, or English learners. On top of surviving in these challenging environments, new teachers must complete their graduate coursework. While many new teachers enter the field with optimism and enthusiasm for “filling the teacher shortage,” they soon realize that the shortage exists for good reasons. As you decide how you want to become a teacher, you’ll also need to ask yourself what you want to teach. The barriers to some fields are higher than others. If you’re teaching middle or high school, you’ll need coursework both in pedagogy and your subject area. If you’re teaching elementary or special education, most likely you’ll only need pedagogy. Typically there is one certification for elementary school teachers and another for middle and high school. Teachers who are politically left may find it unappealing to work in a private or charter school, most of which are non-union, but in many cities, these are the only options for new teachers and in some cases, such schools may be more strategic to organize. In places that have experienced huge charter expansion, like New Orleans, Detroit, and Los Angeles, jobs at stable public schools can be few and far between, and inexperienced teachers will seldom qualify. From an organizing perspective, choosing to teach at a charter or a public school isn’t a moral question but a strategic one. Non-union charter schools are crucial to organize in order to build back the level of density that teachers unions once had before charter expansion, and most unions have had little success on this front. Even if it does seem most strategic to end up in a public school, working elsewhere can help you build your credentials before transitioning, while also giving you an idea of what teaching is like day to day. If you want to join the labor movement, but aren’t sure teaching is for you, education unions, especially in big cities, often represent non-teachers as well. School secretaries, guidance counselors, psychologists, speech therapists, parent coordinators, and special education support staff are often, but not always, represented by the same union. Some of these positions are appealing because they don’t require a college degree, though they may be compensated better than jobs that require similar training. For example, paraprofessionals in New York City need only a high school education-while the wages are low, they have benefits like health insurance and even paid parental leave. Socialists who are eager to jump right into union work but don’t have a teaching license, or those who know a traditional classroom setting isn’t for them, should strongly consider these positions. While some teaching jobs can be stable and well compensated, the differences among regions is vast. A twenty-year veteran with a PhD in North Carolina makes roughly $55,000, while a first-year teacher in New York City with only a bachelor’s degree makes about the same. These are real differences to consider when evaluating the long-term viability of a teaching career. That said, as our fellow teachers in the striking red states showed us, there is the potential for militancy everywhere. This is an introduction to getting a job as a teacher, but ultimately you’ll need support in figuring out where to begin, how to proceed, and how to sustain yourself both in the training and then while laboring as a teacher. If you are considering this work, or have decided you want to pursue it, get in touch so we can support each other in building a teachers movement. There is a growing national network of educators in DSA working to transform our schools, our unions, and our society. Being a member of DSA means there is a pre-existing network of fellow socialists you can tap for support as you undertake this work. “Don’t let the bankers cheat your children out of an education!” read the banners on the streets in 1933, as thousands of Chicago teachers marched through downtown and occupied big banks. Some teachers were beaten by police when a plate glass window was broken during one of the many militant bank protests of that year. In the midst the of the Great Depression, banks and large corporations were evading taxes and getting bailouts from the federal government while city governments cried poor and teacher salaries went unpaid. But through mass action, teachers forced the ruling class to finally pay its taxes and the city to pay its teachers without delay. Their protests were the beginning of a larger working class movement in Chicago. These were some of the roots of what is now a long history of militant teacher unionism. 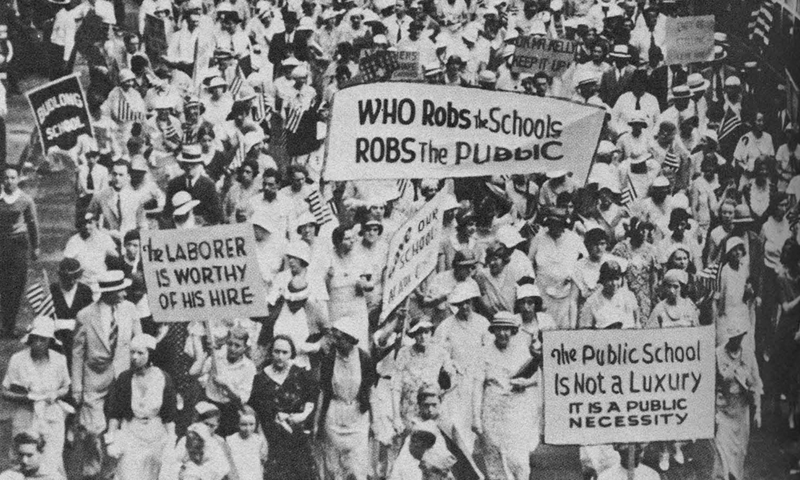 In the 1930s, big cities like Chicago and New York saw teachers consolidating their forces and building militant, democratic unions from the ground up. Yet it wasn’t until the 1960s and 1970s that waves of teacher and public employee strikes, coupled with demands for full union rights, won teachers the right to collectively bargain and strike in many states across the country. By organizing militant union caucuses and bringing their co-workers into escalating campaigns that included strikes and mass action of thousands of workers, teachers, like their brothers and sisters in private industry, were able to win major gains in salary, benefits, and working conditions. By the 1980s, these protracted fights had elevated their profession to new heights and transformed the American public education system into a cherished institution respected around the world. Yet in the last few decades, corporate America has gained new advantages and power over our class, implementing a neoliberal program to privatize, defund, and eventually dismantle the public sector, including public education as we know it. The good news is that teachers and other school workers are beginning to fight back in numbers. We are finding that where there is a “militant minority” of socialists and other unionists with an orientation toward class struggle, opportunities exist to move tens of thousands of teachers and public employees into battle to save public education. Teaching is proving to be one viable way for socialists to get into the labor movement and wage class struggle in a key industry that is under attack by capital. Teachers across the country and indeed the world have shown us that if we organize in the schools, we can not only win concessions from the millionaire and billionaire class, but can also set a powerful example for the entire working class to follow.